Facts: A student of the photographer Lewis Hines. He helped, like Alfred Stieglitz, to establish photography as an art form. He took photos in NY, Europe, and Africa. One of his most famous photos is titled Wall Street, photographed in 1915. 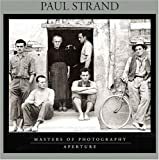 Paul Strand was more than a great artist: he discovered that photography had the potential to be the most dynamic medium of the twentieth century. Purity, elegance, and passion are the hallmarks of Strand's imagery. This inaugural volume of Aperture's Masters of Photography series presents forty-one of Strand's greatest photographs, drawn from a career that spanned six decades. Included are his earliest experimental efforts, created from 1915 to 1917, which Alfred Stieglitz declared had begun to redefine the medium. Subsequent photographs reveal the artist's impeccable vision in locales as diverse as New England and the Outer Hebrides, France, and Ghana. During Strand's last years, he concentrated on still lifes and the poignant beauty of his own garden at Orgeval, France. In an introductory essay, Mark Haworth-Booth, Curator of Photography at the Victoria and Albert Museum, London, provides an overview of the artist's life and his enduring contribution to photography.